If you are comfortable with your relationship with the church and God, then do not read this book. Randy Alcorn will convict you with scripture that you have passed over too many times. — T.T. I'm halfway through Money, Possessions, and Eternity and can’t put it down. Encouraged and affirmed in some areas. Challenged and repenting in other areas. Thank you for speaking truth. I believe God sent this book to me to alter the eternal course of my family for generations. Powerful. —L.W. God has been challenging me personally on my view of material possessions as I've been reading Money, Possessions and Eternity, and something awesome happened yesterday. I'm an overseas missionary, currently home on furlough. After reading chapter 7 dealing with our earthly treasures and heavenly treasures in Matthew 6, I got an email from a colleague in [our country] letting me know that our house had been broken into. As I was reading the email, fear began to take over and a sense of extreme loss and sadness overwhelmed me. Then I remembered what I just read in Matthew 6! Almost everyone I've shared this story with has had the same reaction…”God was preparing you for the loss and sadness that you would have to endure because of these kinds of things.” But my answer has been, absolutely NOT! God used this situation to prepare me to hear the message in Matthew 6, and that message rang loud and clear: Do not be sad when you lose your stuff! Our true treasure is only found in Heaven. Thank you God for revealing your truth to me in such a personal way. — C.M. I just finished reading Money, Possessions, and Eternity. It was one of the most stirring and convicting books I've ever read, except the Bible of course. — A.C. Thank you for your obedience in writing this book, specifically chapter 8. It has changed my life forever. — G.G. This book has truly been a blessing to me. It has helped me to understand how we can take the simplest of things and allow them to be stumbling blocks in our relationship with God. Your book opened my eyes to how we can so easily let the littlest things come between us and God. — J.L. We are missionaries to a small people group in Honduras. These people don't have a lot of money to budget, but they absolutely need the concepts in the book. All we have belongs to God. We are stewards of His things and money. We were thankful for all we have learned about stewardship over the years, but I believe the strength of our biblical principles came from MPE! — C.W. I was first introduced to Randy’s books when a visiting speaker to our church plugged several of his titles. I obtained a copy of Money, Possessions and Eternity and began to read it a few months later. I wondered what to expect and thought reading it could be hard work. But the more I read, the more gripped I became—such practical, down-to-earth, biblical teaching. I read with increasing interest and enthusiasm, especially the sections about eternal rewards. Despite being an elder in my church, the son of a pastor, and the grandson of an evangelist, I had missed this encouraging doctrine so abundantly found in the Bible. I struggled with the concept of receiving so much in eternal rewards from God, but I found your oft-repeated phrase, "It's not my idea, it's God’s," very helpful as I began to understand the significance of this teaching. I now long for my real home. Heaven has become such a reality that it seems natural to talk about it in ordinary daily conversation with absolute certainty. — T.J. I am desperately concerned about the covetousness of our culture and praise God for such good resources that share what the Scripture says about money. My oldest son is 9 and has been slowly reading Money, Possessions, and Eternity on his own initiative. I told him that it was the best thing that I have read about the very important topic of money, and he decided to read it and says that it is very good. I am excited for him and praying that God will use this and other things to give him a good foundation for life. — T.T. It is with deepest humility that I say, we gave over 20% of our gross income away last year. Thanks for the inspiration in Money, Possessions, and Eternity. We have always been faithful tithers and considered ourselves generous with our money. But your book was a call to examine how much more we could give. Not only have we not missed the money, we’ve been truly blessed in so many ways by sharing in our abundance. Here’s to 25% next year! — S.D. Thank you for writing your book Money, Possessions, and Eternity which I downloaded on my Kindle. I read the book and it was so exciting! I prayed and asked God to make me fearless, to step out in faith in whatever it is He is asking me to do. I notified my church that if anyone needs a place to stay, I will offer up my new home. A week later, the church sent my way a woman who had come to our church for the second time and had asked for help and needed a place to stay. She will be living with me very shortly and I will be on an adventure I never thought would happen so soon. I know it will be hard, it will require immense sacrifice (sacrifice that I initially thought was only a financial one), but God's love for us has no conditions. Abraham was willing to sacrifice his son, so the depth of my sacrifice should have no bottom. My life has turned and I have taken a step out in faith and I will never be the same again! — R.O. When I started reading Money, Possessions, and Eternity, I began to underline, only to decide later that I it would actually be easier to find a passage or two not pregnant with so much meaning and worth memorizing. What was the point of making the book shine with ink marks all over? It would only make it more difficult to read it the second time. It took me a year to read the book because I stopped to dwell on every word. It changed my life. If you aren’t willing to have your motives examined and to be uncomfortable, then don’t read this book. Money is one of those subjects we dread hearing about in church. It seems like everywhere you turn these days some ministry or other is asking for money. This is also an area where I have had a really hard time surrendering total control to the Lord. But this is an area where the Lord has really been challenging me. Little by little, my excuses and justifications are being stripped away. This book does not strictly deal with money. It also deals with motives. Randy is not only concerned with what Christians do, but also why they do it. This is one book that you will want to read with a highlighter in hand. It is literally chocked full of wisdom. I also applaud Mr. Alcorn for having the courage to deal with thorny issues like greed, gambling, support-raising, debt, and sacrificial giving. I wish I had read this book years ago. But this is not a book about condemnation. Mr. Alcorn makes the point that at long as we are still alive, it is never too late to make a fresh start in this area. This is a book that will give you much food for thought. I think it should be required reading for every believer today—especially new believers. But this book is also beneficial for people who have been Christians for many years. This book will definitely spark some interesting discussions. I highly recommend this book. It’s sad that we have gotten so far from the biblical model that books like this are even needed, but they are. — L.M. I can’t tell you how important I think this book is for all believers. We as Christians fall desperately short when it comes to biblical stewardship. When I first started this book, I read it numbly because it seemed overwhelming. But I prayed as I read, asking God to reveal areas of faithlessness in order to view money more wisely. I expected another book on “love of money is the root of all evil, don’t be materialistic, remember to support the poor and missionaries and oh, tithe at least 10% on the gross.” It is so much more than that. If we had the attitude and views about our stewardship as God does, and as Randy Alcorn attempts to reveal, the world would truly be changed. Unfortunately, we will continue in capitalist, corporate America to waste it away on pleasure and things that will not last for eternity. I am praying God will use this book to make a difference, one Christian at a time. — J.P. I recently read Money, Possessions, and Eternity. This book has been life-changing for me. Thank you so much for planting that seed that God has grown into a much more fruitful life. I’m now paying back-tithes from the last year, and giving away even more. God has changed some situations in my life, but more than this, He has given me grace to love and give of myself, despite provocation towards bitterness. The single biggest life-changing principle was that there is no such motivator as selflessness. This was hard to swallow at first, but your logical argument (combined with God’s prompting) persuaded me otherwise. — A.
I am a young financial advisor, and I have been struggling with the weight of guiding people’s finances and influencing their decisions. Your book, Money, Possessions, and Eternity led me to abandon many of the things the world approves of, and adopting a more Christ-centered, eternity-focused view of money. — J.C. Thank you for writing Money, Possessions, and Eternity. I am a 21-year-old college student. God definitely used it in instructing me to surrender my finances to Him. During my high school years, God confirmed this radical calling on my life. He told me to be different. He told me that “where your treasure is, there your heart will be also.” He deeply desired for my heart to be where His was and is to this very day. I knew that I would have to align my checking and savings accounts with His heart, too. I have found that when I give, God continues to supply my needs. In addition, I am freed from the chains of materialism when I submit to His authority. I want to thank God for providing financially the past three years of college. I can say to this day, I did not ask my parents for one penny of my college tuition, and I never had to take out a loan. Praise God! Out of daily surrendering my finances to the Lord, I see that with everything God gives me, I find the most fulfillment in blessing Him back with it. — R.
This book was a huge game changer for my family and me. Huge. Everything has changed, and to say that God has blessed us more than we could ever ask or imagine would be an understatement. My book is rarely sitting on a shelf because I am constantly opening it to gain clearer and greater insight into a specific money topic. As we have adopted the principles articulated in Money, Possessions, & Eternity—God's principles—we have experienced a relationship with God's money that is profound. There is no way we will ever go back to managing money our way. We have experienced so much pure joy—the joy that only comes from obeying Christ—that we will continue to seek God's plan for our money. We continue to be blessed by our merciful God who humbles us and teaches us and stretches us as we attempt to glorify Him in our financial decisions. — A.H. I first heard about you when a friend recommended your book Heaven. So I went to EPM's site, and for some reason instead of ordering Heaven, your book Money, Possessions and Eternity caught my eye and I ordered it. Once I received it I could not put it down! My wife and I immediately decided to overhaul our finances and start consistently tithing and set goals for giving. A week later my boss gave me a bonus check that was totally unexpected. We are also added several worthy organizations to our monthly giving. I read The Treasure Principle next, and am halfway through If God is Good. Where has this teaching been all these years?! Thanks for writing the most life-changing book I have ever read next to the Bible. — R.R. Learn more about and purchase Money, Possessions and Eternity. Money, Possessions & Eternity is a book destined to impact generations. It is a classic study of what God wants us to know about handling money with eternity in mind. I heartily recommend it. What Inspired You to Write Money, Possessions and Eternity? At a book signing at Lifeway Christian Bookstore in Beaverton, Oregon Randy answered a variety of questions. In this clip, he answers the question,"What inspired you to write Money, Possessions and Eternity?" 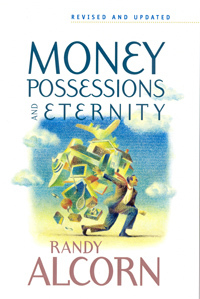 In this clip, Randy Alcorn shares about his book Money, Possessions and Eternity.